The conventional X-ray examination was the first medical imaging procedure in history. Its technology is based on X-radiation. X-raying has been a basic diagnostic procedure to the present day. The possibilities and technical preconditions have improved significantly within the last 100 years, which is why an optimal X-ray image with a low radiation exposure is possible today. Digital luminescence radiography is used at Beta Klinik, which means that images can be digitized and do not have to but can be printed. X-rays penetrate the body and react with a medium behind it during an X-ray examination. Film is the medium of conventional X-raying. A digital receiver creating digital data sets substitutes film in case of digital X-raying. 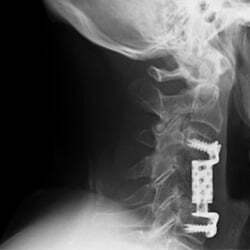 The image on the left is detail of an x-ray image created after cervical spine surgery. Postsurgically, it was crucial to assess the adequate position of the vertebral body replacement. At Beta Klinik, we use a digital X-ray device, enabling us to print conventional X-ray films as well as creating digital data sets. When is an X-ray examination indicated? X-ray examinations are a basic diagnostic means, being an essential foundation of daily examinations. When it comes to examining bone fractures and thoracic organs like lungs (pneumonia), conventional X-raying is particularly valuable. Restricted indication is given during pregnancy. The need of every X-ray examination must be evaluated in pediatric radiology. How is an X-ray examination carried out? X-raying is a very quick and painless examination. Creating an X-ray image only takes seconds, after positioning the patient according to the area to be examined. Digital X-ray procedures enable us to convert images into digital data sets that can be put on a CD or DVD. Sending images via internet is also possible within shortest time. Images made only a few minutes ago, can be sent to any country of the world to a physician that provides further treatment to the person. This physician is then able to evaluate the pictures comfortably within a few mouse clicks.